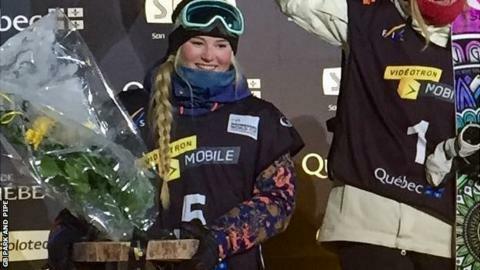 British snowboarder Katie Ormerod has won the first World Cup podium of her career after finishing second in a big air event in Canada. She finished behind Winter Olympic slopestyle champion, American Jamie Anderson, in Quebec City. Ormerod said on Twitter: "So excited to be on my first World Cup podium here in Quebec City for the Big Air!! Stoked on 2nd place!" Ormerod, 18, is considered a medal hope for Britain, alongside Billy Morgan, Aimee Fuller and skiers James Woods and Katie Summerhayes. Britain is aiming to add to Jenny Jones' bronze in slopestyle in Sochi 2014. At the age of 15, Ormerod was the youngest girl to land a double backflip on a snowboard and a year later she was the world's first female to land a backside double cork 1080. She competed in her first X Games last month and finished sixth in slopestyle in Aspen, Colorado.